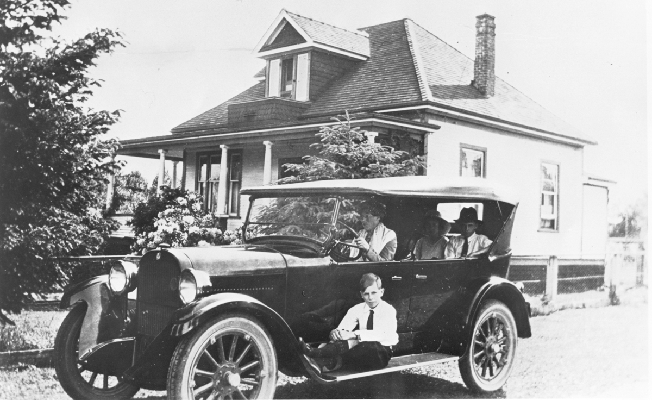 A new 1925 Dodge Touring car parked in front of the Poole house with Mrs. Alice Poole behind the wheel. Inside the car are Louise and Abner in the back seat with Albert on the running board. Mr. Abner Poole Sr. took the picture. Despite her position behind the wheel, Alice was just pretending as she never learned to drive . The Poole family moved to Vancouver from India in 1921. Shortly after their arrival, Mr. Abner Poole purchased six acres on the west side of Laity Street near River Road, and it was three months before they could move from Vancouver. Louise and her two brothers, Fred Abner and Albert, attended Maple Ridge Elementary School, and later, MacLean High School. 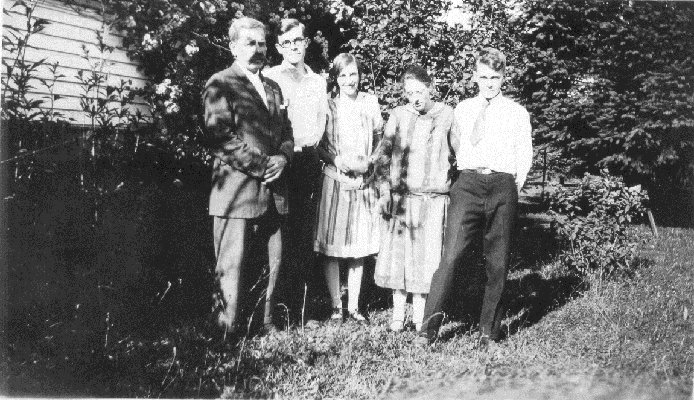 Poole family in their yard on Laity Street. From left: Abner Senior, Albert, Louise, Alice, Abner Junior. 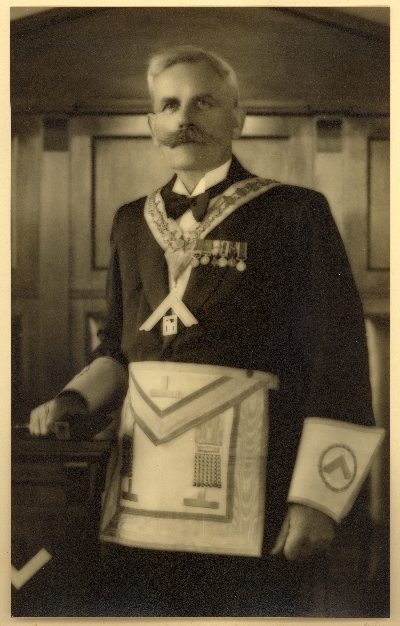 Abner Poole in his Masonic regalia in 1923. Louise began writing poetry in her late teens. Shortly before she died she wrote nine poems from her hospital bed and agreed they brought her close to a lifetime total of 1,000, many of which were published in periodicals and small poetry books. Always a good student, Louise was a 1932 graduate of UBC with a degree in English and French. Maple Ridge had the dubious distinction of having the lowest paid school teachers in B.C., when Louise Poole began to teach at MacLean High School in 1934, but she was glad to have an opportunity to teach upper grades English and French. Before long, she was involved in school activities that were lifelong passions- creative writing and drama. She directed many high school plays, often winning awards in festivals. If she had trouble finding suitable material, she would write a script to suit her actors. 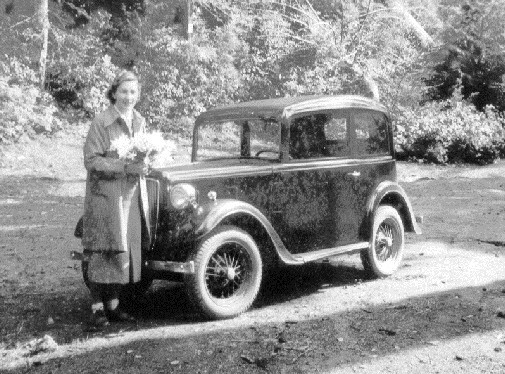 Louise Poole posed next to the front of her tiny sedan car in 1938. She drove a series of tiny cars. It was an Austin 7 aka “Baby Austin”. Classmates remember High School boys picking up and turning them sideways so she couldn’t drive it away until she hollered. 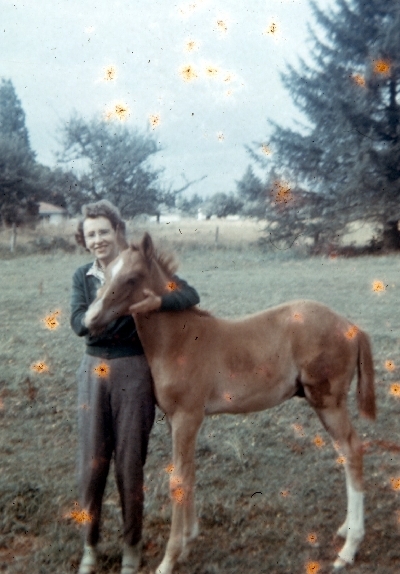 Louise Poole with a long-legged colt in the early 1940s. She taught in Maple Ridge, mainly English and French, for 37 years, retiring in 1972. After her retirement, she continued to be active as both a horsewoman and a puppeteer with the University Women’s Club who did shows at schools and libraries. Not only did she perform the puppet shows, she wrote many of the scripts used. Louise passed away in November of 1997.